F/O James Atkinson Dale, RNZAF NZ425562 – Navigator. Killed age 27 on the 25th of August 1944. Son of James Murray Dale and Maude Mary Dale, of Wellington City, New Zealand. Buried Rheinberg War Cemetery, Germany.. Grave location – Coll. grave 8. K. 8-10. Twenty eight aircraft took off as detailed to attack Russelsheim. Of these twenty five attacked the primary target and reported a good concentrated raid. A.A. opposition was slight, but enemy aircraft were active and one of our aircraft had two inconclusive combats. Another was unable to identify the target and jettisoned its load. A further one was caught in searchlights over the target and during evasive action lost both ailerons. This aircraft was captained by NZ424504 .F/S. O’Callaghan, E. The navigator 958564 .F/S. Hartley, R., kept the aircraft on track on the return journey even though his instruments were unserviceable and his chart lost. Two aircraft failed to return, they were captained by NZ422382 .F/O. J. Fleming and NZ421345 .F/S. Barker, R.
F/O James Allan Fleming, RNZAF NZ422382 – Pilot. F/S Frank Arthur Vincent, RAFVR 1395910 – Air Bomber. Sgt. Eric Garforth, RAFVR 2206796 – Wireless Operator . Sgt. Kenneth Eric Croxon, RAFVR 1893473 – Flight Engineer. Sgt. Edwin Slater, RAFVR 2210570 – Mid Upper Gunner. Sgt. Alan Raymond Bryce Stewart, 1344346 – Rear Gunner. Lancaster Mk.I LM593 AA-N was brought down over Germany, crashing near Neunkirchen; 38 miles North West of the target. There were no survivors. All seven crew are now buried in the Rheinberg War Cemetery. P/O Errol Thomas Paterson Dalzell, RNZAF NZ411378 – Observer. Killed age 22 on the 28th of August 1942. Buried Hanover War Cemetery, Germany. Grave location – 5. K. 10. Twelve aircraft were detailed to carry out the above attack. Bomb load of 4000 lb. 500 lb. and incendiaries were dropped in the target area. Numerous fires were seen in the whole area. A.A. fire was moderate, very few searchlights were encountered. Wellington BJ.584 captained by Sgt. Burril met JU88 when about 30 miles from target, combat ensued in which Sgt. Burrill’s aircraft was seriously damaged and port engine put out of action. The rear gunner, Sgt. Gorman claims to have shot down the JU88 and to have seen it falling in flames to the ground, the bomb load was jettisoned, and he turned for home. The aircraft failed to maintain height and was down to 700ft at the Dutch Coast, being shot at by light A.A. fire. He crossed the sea still losing height and belly landed at R.A.F. Wattisham on return. The weather was fine, navigation was excellent. Wellington BJ.708 captained by F/Lt Osborn failed to return. F/L Andrew Francis Atterbury Osborn, RAF 73033 – Pilot. 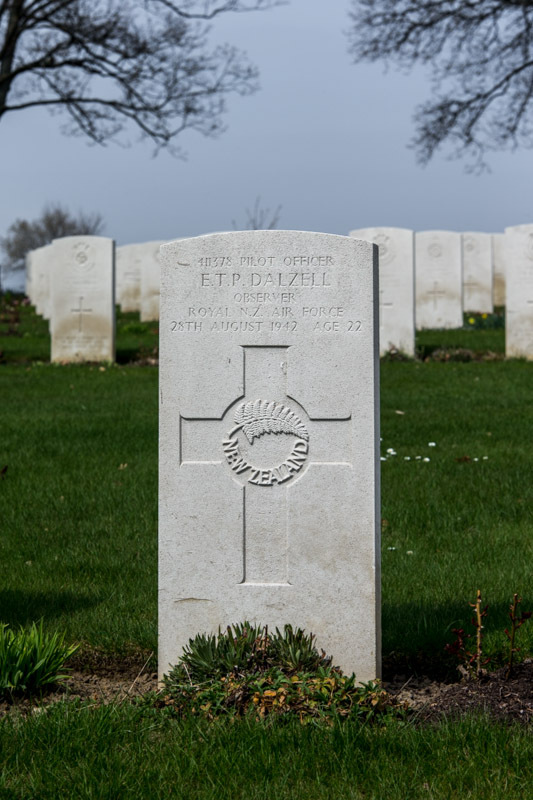 P/O Errol Thomas Peterson Dalzell, RNZAF NZ411738 – Observer. Sgt. Denis Patrick Hogan, RNZAF NZ412331 – Wireless Operator. Sgt. Roderick McGregor, RNZAF 1100964 – Front Gunner. Sgt. Victor Arthur Tunbridge, RNZAF NZ411788 – Rear Gunner. Wellington Mk.III BJ.708 was brought down near the town of Melsungen, 18miles south of Kessel, probably as a result of flak damage. There were no survivors. All five crew were initially buried in the Korle Cemetery, Melsungen, but later reinterred at Hanover. F/O Alfred Thomas Dance, RNZAF NZ42495 – Air Bomber. Lost without trace age 25 on the 4th of November 1943. Son of Albert William and Elizabeth Dance, of Blenheim, Marlborough, New Zealand. Commemorated Runnymede Memorial, Surrey, England.. Grave location – Panel 197. Four aircraft were detailed to carry out the above operation, with mines of 1500lbs. This was an unfortunate night as three aircraft failed to return and the other aircraft returned early having jettisoned its mines. This aircraft met an enemy night fighter and sustained damage to the port wing, starboard flap, rear turret and many large holes in the fuselage, the rear gunner, Sgt.W. HURDIE, was killed during the combat. The weather was bad and ten tenths cloud made visibility poor. Navigation was good. The missing aircraft were Stirlings MKIII BF461, Captained by P/O.G.K.WILLIAMS, BK778 Captained by P/O.W.S.MASTERS and EE897 Captained by F/O. N.WILSON. F/O Norman Clarence Bruce Wilson, RNZAF NZ417139 – Pilot. F/O Thomas Lodge, RNZAF NZ417284 – Navigator. F/S Ronald Charlton, RAFVR 644136 – Wireless Operator. Sgt. Raymond Walter John Stratton, RAFVR 1166593 – Flight Engineer. Sgt. Leonard Charles Gaskin, RAFVR 1392668 – Mid Upper Gunner. F/S Arnold Goodrick Fawcett, RNZAF NZ422698 – Rear Gunner. EE897 was lost without trace. All seven crew are commemorated on the Runnymede Memorial. F/S Jack Neville Darney, RNZAF NZ42376 – Pilot. Lost without trace age 22 on the 31st of July 1943. Son of John Edmond Darney and of Olga Elenore Darney (Nee Berntsen), of New Plymouth, Taranaki, New Zealand. Grave location – Panel 198. Thirteen aircraft were detailed to attack the above targets with incendiary bombs of 30lb. And 4lb..One aircraft returned early as rear turret was unserviceable and two failed to return. The remainder successfully dropped their bombs in the target area, large concentrated fires and some explosions were seen. Moderate heavy and light A.A fire co-operating with searchlight belts were encountered, and one aircraft was slightly damaged in the mid- upper turret. Some enemy aircraft were seen, the aircraft captained by F/S. O. WHITE sighted an unidentified aircraft which attacked three times. Each time the mid upper and rear gunners fired a burst, and strikes were seen on the enemy aircraft which then fell away and claimed to be damaged. The weather was good with clear visibility except for haze caused by fires. Navigation was very good. On return, one aircraft landed at HARDWICK, due to shortage of petrol. The missing aircraft were Stirling Mk.III BF458 captained by Sgt. A.J. THOMAS and Stirling Mk.III EE915 captained by F/Sgt. J. DARNEY. F/S Robert James Stone, RNZAF NZ415383 – Navigator. Sgt. Ronald Charles George Evans, RAFVR 1390444 – Air Bomber. Sgt. George Chamberlain Davies, RAFVR 1027862 – Wireless Operator. 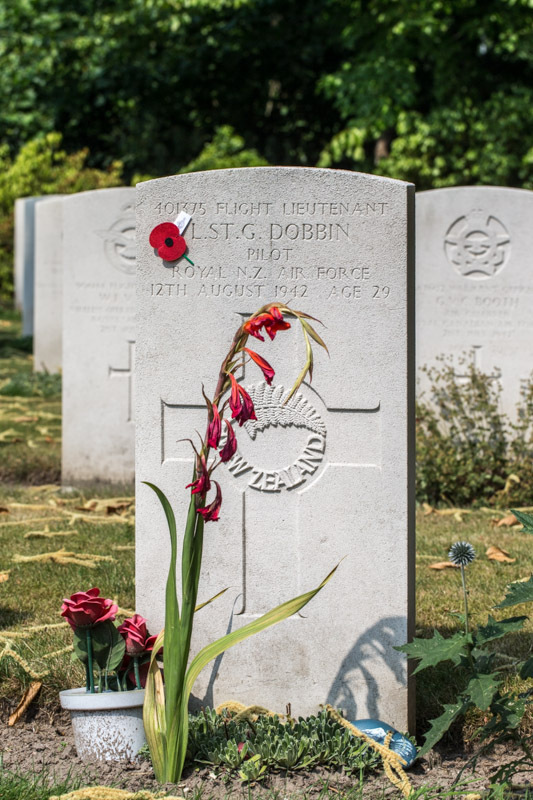 P/O Leonard Charles Dive-Robinson, RAFVR 143800 – Flight Engineer. P/O Peter Sylvester Anthony St. Ledger, RAAF AUS.425375 – Mid Upper Gunner. Sgt. Terrance James Vercoe, RNZAF NZ415566 – Rear Gunner. Stirling Mk.III EH905 AA-R was lost without trace. All seven crew are commemorated on the Runnymede Memorial. Sgt. John Victor Dartnall, RAFVR 1811761 – Mid Upper Gunner. Killed age 19 on the 30th of May 1943. Buried Reichswald Forest War Cemetery, Germany.. Grave location – Coll. grave 29. E. 15-18. Twenty aircraft were detailed to carry out the above operation with bombs of 2000lb, 1000lb, and incendiaries of 30lb and 4lb. One aircraft failed to take-off owing to the rear turret being unserviceable, and two returned early. Four aircraft failed to return. The remaining thirteen aircraft successfully dropped their bombs in the target area. Very large fires were seen and also some big explosions. Some heavy A.A.Fire was encountered, but it was ineffective. No searchlights were seen. A few enemy aircraft were seen and one short combat took place, but no damage was sustained by our aircraft. The weather was good in the target area, but visibility was impaired by smoke from the fires. Navigation was very good. The missing aircraft were Stirlings Mk.III BK776 Captained by P/O. R.F.Bennett, Mk.I EF398, captained by F/O. R.B. Vernazoni, MK.III EH881 captained by Sgt. J.H. Carey and Mk.III Bf561 captained by Sgt. S.R. Thornley. Sgt. Sidney Russell Thornley, RNZAF NZ40109 – Pilot. Sgt. A. McWilliams, RNZAF NZ416586 – Navigator. Sgt. Allan Corson Anderson McPhail, RNZAF NZ41194 – Air Bomber. Sgt. Domenico Ruocco, RAFVR 1383593 – Wireless Operator. Sgt. Cyril Walter Larkin, RAFVR 904570 – Flight Engineer. Sgt. John Victor Dartnell, RAFVR 1811761 – Mid Upper Gunner. Sgt. Frederick George Hooper, RAFVR 1234152 – Rear Gunner. Stirling Mk.III BF561 AA-O was brought down near the village of Gladbeck, 21 miles North West of the target. The crew may have been on their bombing run-up when hit by either AA fire or by a night- fighter. The bomb load was still on board when the aircraft crashed and exploded on impact, killing all on board. They were buried in a collective grave at Gladbeck but later reinterred at Reichswald Forest Cemetery. F/S Thomas William Darton, RNZAF NZ416465 – Pilot. Lost without trace age 22 on the 26th of May 1943. Son of George Edward and Louisa Jane Darton, of Gisborne, Auckland, New Zealand. Sixteen aircraft were detailed to carry out the above attack with bombs of 1000lb and incendiaries of 30lb and 4lb. Four aircraft returned early owing to engine trouble, and one failed to return. The remaining eleven aircraft successfully dropped their bombs in the target area, and some large explosions were also seen. Both heavy and light A.A. Fire was encountered, co-operating with searchlights, which were ineffective. Some enemy aircraft were seen and two short combats took place, but no damage was sustained by our aircraft. Ten tenths cloud was prevalent in the target area, but visibility was fairly good. Navigation was very good. This missing aircraft was Stirling Mk.I. BK602, captained by Sergeant T.W. Darton. Sgt. Thomas William Darton, RNZAF NZ416465 – Pilot. Sgt. Dudley Dobson Coates, RNZAF NZ421318 – Navigator. Sgt. John Milton Patrick Riordan, RNZAF NZ422668 – Air Bomber. Sgt. John Charles Lawrence Whiteman, RAFVR 1234862 – Wireless Operator. Sgt. Alick McQuater, RAFVR 1369879 – Flight Engineer. Sgt. Stephen Redpath, RAFVR 1572718 – Mid Upper Gunner. Sgt. Frederick Philip Wilshire, RAFVR 1170594 – Rear Gunner. Stirling Mk.I BK602 AA-R was shot down by a night-fighter off the Belgian/French coast and went down into the sea off IJmuiden. The attack probably took place within the dreaded German air defensive ‘Box’ when BK602 was en route to the target area. Four bodies were recovered and identified as Sergeant’s Coates, Whiteman, Redpath and Willsher. 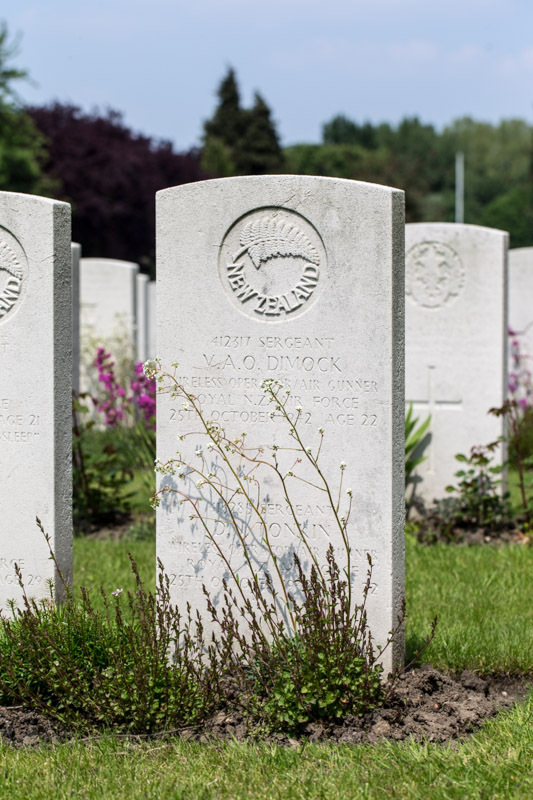 Coates and Whiteman are buried in Oostende New Communal Cemetery; Redpath lies in Dunkerque Town Cemetery and Wilsher in Bergen op Zoom War Cemetery, Holland. Sergeant’s Darton, McQuarter and Riordan are commemorated on the Runnymede Memorial. Sgt. Charles Raglan Davey, RNZAF NZ413937 – Pilot. Killed age 21 on the 8th of March 1943. Son of Mr. and Mrs. Frederick Charles Davey, of Dargaville, Auckland, New Zealand. Buried Durnbach War Cemetery, Germany. Grave location – 2. G. 11. Nine aircraft were detailed to carry out the above attack with bombs of 2,000 lb. 1,000 lb. 500 lb and incendiaries of 30 lb. and 4 lb. One aircraft returned early owing to engine trouble and another failed to return. The remaining seven aircraft successfully dropped their bombs in the target area, large fires being seen, one large explosion from the centre of target, was seen one hundred miles away as the aircraft were returning. Both light and heavy A.A. fire was encountered co-operating with searchlights, they however, proved to be ineffective. Stirling 1 BK646 captained by P/O Lowe, was attacked by an enemy aircraft near Saarbrucken on the return journey. The enemy aircraft opened fire with cannon and a stream of tracer came into the cockpit, one exploding near the second pilot’s leg. Corkscrew tactics were adopted, but after seven minutes the enemy aircraft was lost. The only casualties were the second pilot, who was wounded in the leg and the Captain, who had slight face cuts. The aircraft successfully returned to base. There was a slight haze at the target, although visibility fairly good. Navigation was very good. The missing aircraft was Stirling 1 BF437, captained by Sergeant C.R. Davey. F/S Anthony Arlen, RCAF R.84152 – Navigator. Sgt. Ian James Duncan Brodie, RAFVR 1344759/ 147474 – Air Bomber. Sgt. Leighton Mansel Stone, RAFVR 1313099 – Wireless Operator. Sgt. Arthur Edgar Howlett, RAFVR 528778 – Flight Engineer. Sgt. Andrew James Feenan, RAFVR 632983 – Mid Upper Gunner. Sgt. Alfred Bertram Tarrant, RAFVR 1450019 – Rear Gunner. Stirling Mk.I BF437 AA-L was brought down near Philippsburg, 22 miles North North East of Carlsruhe (18 miles south of Mannheim). All seven crew were killed. Sgt’s Davey and Brodie were buried at Mannheim but later reinterred at Durnbach. The other five crew members are commemorated on the Runnymede Memorial. F/S Alexander Davidson, RCAF 181120 – Rear Gunner. Killed age 19 on the 24th of August 1943. Son of Alexander Davidson, and of A.D. Davidson, of New Westminster, British Columbia, Canada. Buried Berlin 1939-1945 War Cemetery, Germany.. Grave location – 1. J. 8. Twenty three aircraft were detailed to attack the above targets with bombs of 1,000lb., 500lb., and incendiaries of 30lb and 4lb.. Five aircraft returned early owing to failure and three aircraft failed to return. The remainder of the aircraft successfully dropped their bombs in the target area and all of the crews agreed that it had been well and truly hit. The fires were all concentrated and huge columns of smoke together with heavy explosions could be seen. A moderate heavy A.A. barrage co-operating with searchlights were encountered, but only one aircraft received damage. A great number of enemy aircraft were seen and several combats took place. The aircraft captained by F/Sgt. WILKINSON sighted a JU88 passing above, the Mid-upper and Rear Gunners fired and strikes were seen on the enemy aircraft which was then lost sight of and is claimed to have been damaged. The aircraft captained by F/Sgt. WHITEHEAD whilst over BERLIN sighted an enemy aircraft on the starboard quarter, 300yds away. The Rear Gunner fired a five second burst and the enemy aircraft was seen in flames diving to earth, and was claimed as probably destroyed. The same aircraft encountered another unidentified aircraft 300yds away on the starboard quarter. The Rear Gunner fired another five seconds burst and the enemy aircraft exploded and disintegrated. It was claimed to be destroyed. The aircraft captained by F/O. A. Alexander, whilst over the target sighted a ME110 approaching from the starboard quarter above and firing at his aircraft. The Mid-upper and Rear Gunners replied with long bursts and the enemy aircraft was seen to be in flames. A fire was later seen on the ground and the enemy aircraft was claimed as probably destroyed. Scattered cloud was met on the outward route, but it was clear over the target. The missing aircraft were Stirlings Mk.III BF465 captained by P/O A. RANKIN, BF564 captained by P/O A. Sedunary and EE938 captained by W/O T. Fear. The aircraft captained by F/Sgt. WHITE, O.H. whilst approaching the target area was coned by searchlights and repeatedly hit by heavy A.A. fire, sustaining considerable damage to port main plane. He continued towards the target though still coned by searchlights and was then attacked by a JU88 sustaining hits in the rear of the fuselage which shattered the rear turret and killed Rear Gunner Sgt. Poole, J.. The aircraft was forced into an uncontrollable dive and the captain warned his crew ‘Prepare to abandon the aircraft’. Unfortunately, in the middle of this order the inter-communication failed, and the Navigator, Air Bomber and Wireless Operator abandoned the aircraft, due to the fact that they were unable to contact their Captain. F/Sgt. WHITE jettisoned his bomb load whilst in the dive directly over the target area, managed to regain control of the aircraft when height had been lost down to 6,000ft. The captain and two remaining members of the crew after taking stock of the damage decided to attempt the long and hazardous return journey to base. This they did successfully and made a perfect crash landing at base without lights, flaps or under carriage, as the electrical leads were shot away. W/O Trevor Fear, RAFVR 1317167 – Pilot. Sgt. Brian Hartley Ruddy, RAFVR 1419688 – Navigator. Sgt. Andrew Bain, RAFVR 658930 – Air Bomber. Sgt. Douglas George Woolcott, RAFVR 1290189 – Wireless Operator. Sgt. Charles Munro, RAFVR 1566746 – Flight Engineer. Sgt. Joseph Andrew Cletus Holmes, RCAF R.143622 – Mid Upper Gunner. Sgt. Alexander Davidson, RCAF R.181120 – Rear Gunner. Stirling Mk.III EE938 AA-X was brought down at Mahlsdorf, 7 miles East South East of Berlin. There were no survivors. 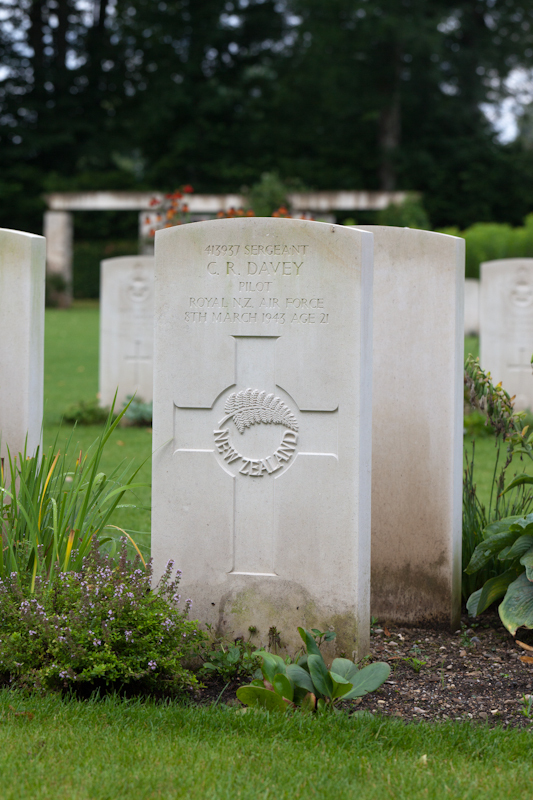 All crew members, except Sgt C Munro, are buried in the Berlin 1939-45 War Cemetery. The flight engineer has no known grave. 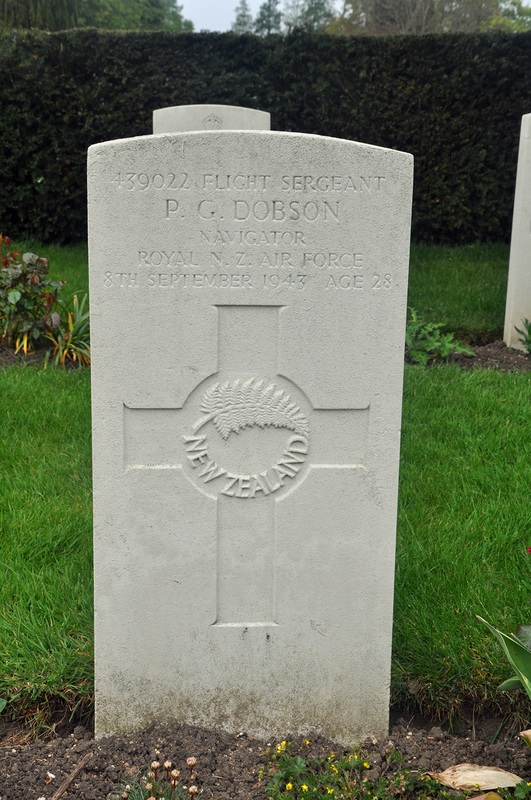 P/O Neil Douglas Davidson, RNZAF NZ422057 – Pilot. Lost without trace age 21 on the 21st of July 1944. Son of J. D. and Margaret Davidson, of Porangahau, Hawke’s Bay, New Zealand. Grave location – Panel 263. Twenty six aircraft took off, as detailed, to attack the oil refinery at Homberg. Nineteen aircraft were successful in bombing the target, with the aid of markers, which seemed well concentrated. Two good explosions were seen and smoke came up from the target area. Heavy A.A. fire was moderate, but fighters were very active, eight combats taking place. Seven aircraft failed to return, the captains were AUS22776 W/O. Gilmour, H., NZ428819 F/S. Howell, E., NZ421829 F/S. Mackay, K., NZ422057 F/S. Davidson, N., NZ42488 W/O. Whittington, H., NZ413219 F/S. Roche, G. & NZ414560 P/O. Burtt, H.
F/S Neil Douglas Davidson, RNZAF NZ422057 – Pilot. Sgt. Arthur Ernest Goddard, RAFVR 1323147 – Navigator. Sgt. Thomas Gilbert Little , RAFVR 1459875 – Air Bomber. Sgt. Douglas Corris, RAFVR 1501099 – Wireless Operator . Sgt. Robert Gerald Sloman, RAFVR 914220 – Flight Engineer. Sgt. Raymond Stanley Lang, RAFVR 1896528 – Mid Upper Gunner. F/S Henry John Hiscox, RAFVR 928092 – Rear Gunner. Pilot, F/S Neil Douglas Davidson RNZAF flew the badly damaged and blazing aircraft on over the River Maas towards Reuver, but turned and tried to land it in the river, he succeeded but it hit the river bank and exploded. The bomb aimer, Sgt. T.G. Little RAF, had managed to bail out, however his parachute failled to open fully and he was badly injured when he fell into the garden of a house in the village of Kessel. He was taken to a hospital, subsequently made a prisoner of war (POW No. 52469) in Muhlhausen POW camp and survived World War II, passing away in 1990. The tail of the aircraft fell away from the fuselage into a field just before impact. F/S Hiscox, Rear Gunner, fell with the turret into a corn field. It is thought he died a day or two afterwards and was found two weeks later by a Dutch farmer’s labourer, Sef Willems, who was a member of the Dutch resistance. F/S Hiscox was buried in the Beesel grave yard. The grave digger had a bunch of flowers with him,but the German soldiers threatened to shoot him if he laid them on completion of the burial, He passed the flowers on to local people who in the dark of night threw them over the cemetery wall onto the grave. Lost without trace age 31 on the 31st of July 1943. Son of George Prophet Davies and Louise Davies; Husband of Joan R. M. Davies, of Southport, Lancashire. Grave location – Panel 147. Sgt. Raymond David Davies, RAFVR 1317623 – Mid Upper Gunner. Lost without trace age 21 on the 14th of March 1944. Son of Margaret Davies, of Porth, Rhondda, Glamorgan. Grave location – Panel 228. Sixteen aircraft were detailed for mine laying off St. Nazaire, Lorient, La Rochelle, and Brest. One aircraft (Captain NZ414567 F/Sgt. Rowberry T.) failed to return. Another aircraft (Captain NZ42999 P/O. C. Baker) returned early with aileron trouble and crashed at Castle Comb, without injury to the crew although the aircraft was burnt out. The remaining fourteen successfully laid their mines, one aircraft landing at Woodbridge on return. F/S Geoffrey Warren Rowberry, RNZAF NZ414567 – Pilot. F/S Graham Stanley Hadfield, RNZAF NZ426239 – Navigator. Sgt. Brian Simmett, RAFVR 1392577 – Air Bomber. Sgt. Sidney Thomas Bishop, RAFVR 1322249 – Wireless Operator . Sgt. Arthur William Horner, RAFVR 1641609 – Flight Engineer. Sgt Alfred Newnham, RAFVR 1172993 – Rear Gunner. No official account of the loss of the crew exists, or is officially accepted and as such the Rowberry crew are recorded as lost without trace. Sgt. 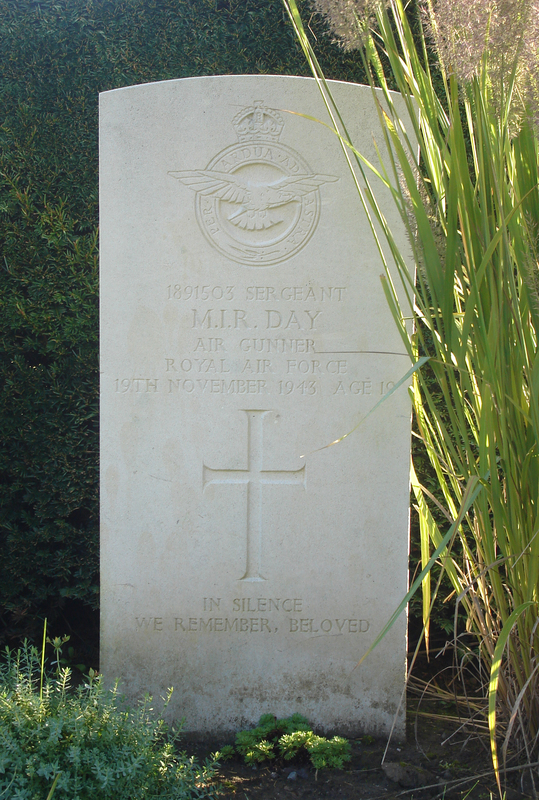 Ronald Davies, RAFVR 751130 – Front Gunner. Killed age 23 on the 6th of September 1941. Son of William and Mary Davies, of Northampton; Husband of Nora W. Davies, of Northampton. Buried Borculo General Cemetery, Holland. . Grave location – Plot U. Coll. grave 1-5. Thirteen Wellington aircraft were detailed to carry out the above attacks. One of these aircraft, X9767 captained by P/O Johnson, failed to return to base. A mixed bomb load was carried and consisted of 1,000 lb GP, 500 lb GP, 250 lb GP, and SBC’s of 4lb incendiaries. One aircraft was seen under attack on the Dutch-German frontier. Another aircraft was observed possibly being shot down by dual AA fire/searchlight action about 15 miles west or south-west of the target. An enemy aircraft was seen taking off from Schipol, but no attacks occurred Bombs were dropped in the target area and numerous fires were started. A.A. fire was light over the target area, but heavy en route, while searchlights were working in cones around target. Three enemy aircraft seen but no attacks made. The weather was good over the whole journey. P/O James Edward Johnson, RAFVR 66519 – Pilot. Sgt. Peter Simpson Dickson Johnston, RAFVR 776002 – 2nd Pilot. Sgt. Robert Michael Minchin, RAFVR 751355 – Navigator. Sgt. Wilfred Bearne, RAFVR 976174 – Wireless Operator. Sgt. William John Barker, RAFVR 1378561 – Rear Gunner. Wellington Mk.Ic X.9767 AA-S was intercepted by a German night fighter (flown by Oblt Emil Woltersdorft, Unit 111, NJG1) over Holland. The Wellington crashed into the sea at 00.11hrs near Borculo (Gelderland) South East of Lochem, Holland. None of the crew survived. Their bodies were subsequently recovered and later buried at Borculo General Cemetery. Sgt. Roy Joseph Davies, RAFVR 1603898 – Mid Upper Gunner. Killed age 21 on the 23rd of May 1944. Son of Mr. and Mrs. A. Davies, of Edmonton, Middlesex. Buried Reichswald Forest War Cemetery, Germany. Twenty three aircraft were detailed to attack Dortmund of which eighteen completed their mission successfully. Three aircraft returned early and two failed to return (Captains NZ417016 P/O. E. Burke and NZ42354 P/O. C. Armstrong). The raid was well concentrated and carried out in good weather with excellent visibility. One aircraft had an inconclusive combat with a JU 88. Otherwise the operation was uneventful. P/O Cecil Ernest ‘Snow’ Armstrong, RNZAF NZ42354 – Pilot. F/S Douglas Beardsley Payne, RNZAF NZ426917 – Navigator. F/S Eric William Elliott Marshall, RNZAF NZ415637 – Air Bomber. Sgt. Carl Arthur Warburton, RAFVR 1484107 – Wireless Operator . Sgt. David Sleightholm, RAFVR 1684309 – Flight Engineer. Sgt. Roy Joseph Davies, RAFVR – Mid Upper Gunner. Sgt. James Pepper, RAFVR 1682572 – Rear Gunner. Reports indicate that ND768 was struck by flak on approach to target – with a full bomb load, the aircraft exploded killing all on board. The crew’s remains were buried intially at Hauptfriedhof, Dortmund, but were later reinterred at the Rheinberg War Cemetery. W/O William John Davies, RAF 616191 – Wireless Operator. Lost without trace age 25 on the 21st of July 1944. Son of Benjamin and Grace Davies; Husband of Menai Davies, of Abertillery, Monmouthshire. Commemorated Runnymede Memorial, Surrey, England. Grave location – Panel 213. F/S Kenneth McIndoe Mackay, RNZAF NZ421829 – Pilot. F/S Eric James Quinn, RNZAF NZ4210077 – Navigator. F/O Roy King Jones, RNZAF NZ425611 – Air Bomber. W/O William John. 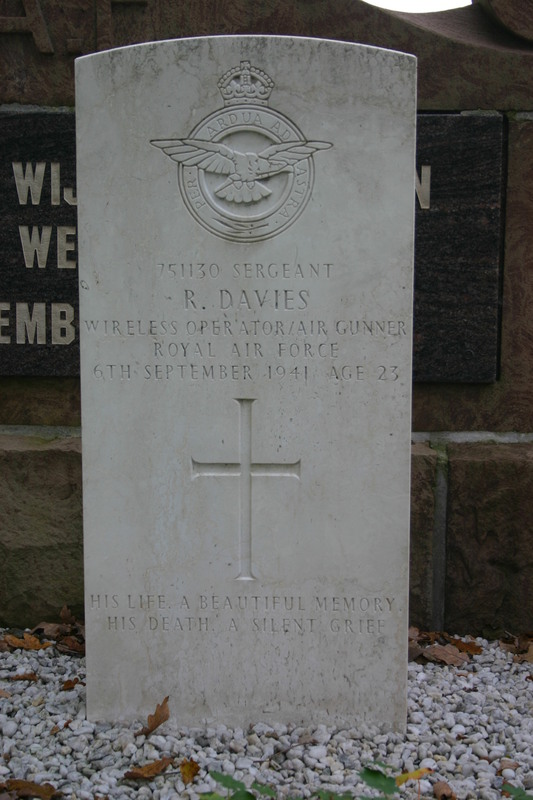 Davies, RAFVR 616191 – Wireless Operator . Sgt. Ronald Knapton, RAFVR 1681317 – Flight Engineer. Sgt. William Joseph Dunn, RAFVR 1520456 – Mid Upper Gunner. F/S JIm Worth, RNZAF NZ425510 – Rear Gunner. Lancaster Mk.III ND800 AA-J was lost without trace. All seven crew members are commemorated on the Runnymede Memorial. Sgt. Jim Jack Davis, RAFVR 629241 – Rear Gunner. Killed age 26 on the 16th of April 1943. Grave location – 20. A. 11. Eleven aircraft were detailed to carry out the above attack, with bombs of 2000 lb, 1000 lb and incendiaries of 30 lb and 4 lb. Seven of the aircraft successfully attacked the target. Large fires and one big explosion were seen. Two aircraft returned early owing to engine trouble. Both heavy and light A.A. Fire was encountered co-operation with searchlights. Two of our aircraft were hit and the Navigator of one was hit in the leg. Several enemy aircraft were seen, but no combats took place. The weather was good on the route, but considerable haze was experienced at the target. Navigations was very good. Stirling Mark III BK.664 captained by F/Lt. D.C.Lowe, which experienced some very accurate A.A. Fire whilst overt the target, found on landing, that this throttle controls were jammed open, he was lucky enough to be able to land, but unfortunately he crashed into a semi built hanger on the aerodrome. The aircraft was an absolute wreck, but all the crew got away safely, although not without injuries. Stirling Mark III W 7469 captained by F/Sgt. K.F. Debenham and Stirling Mark I BF451 captained by P/O K.H.G. Groves failed to return. F/S Kevin Frederick Debenham, RNZAF NZ412211 – Pilot. Sgt. Raymond James Barnes, RCAF R.87330 – Navigator. Sgt. David Michael Turner Watts, RAFVR 1312572 – Air Bomber. Sgt. Peter Braithwaite Pearson, RAFVR 1377412 – Wireless Operator. Sgt. D. Wainwright, RAFVR 1193816 – Flight Engineer. Sgt. John Leslie Marlow, RAFVR 1353768 – Mid Upper Gunner. The circumstances surrounding the loss of Stirling Mk.I W7469 AA-O are unclear. It crashed at Katzenbach, south of Frankfurt, and all but the Flight Engineer, Sgt Wainwright, were killed. The sole survivor was listed as a P.o.W, suggesting he either baled out or escaped from the wrecked aircraft and was captured. The crew members who died are buried in the Rheinberg War Cemetery, south of Wesel. 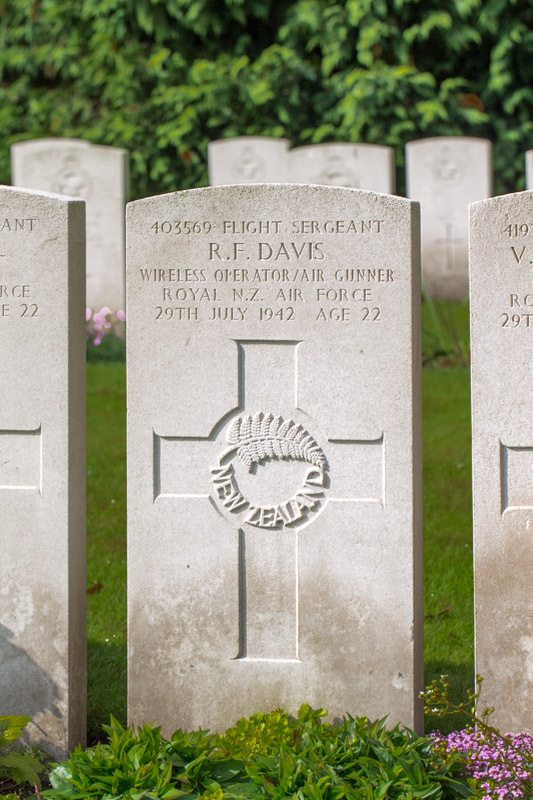 F/S Ronald Fraser Davis, RNZAF NZ403569 – Wireless Operator. Killed age 22 on the 29th of July 1942. Son of C. A. Davis, and of Elizabeth Mcewan Davis, of Outram, Otago, New Zealand. Buried Becklingen War Cemetery, Germany. Grave location – Coll. grave 14. F. 12-14. F/L Peter John Wilson, RNZAF NZ402475 – Pilot. F/S Victor Kenneth Westerman, RNZAF NZ41970 – 2nd Pilot. Sgt. Robert Hylton Brisco, RNZAF NZ411204 – Observer. Sgt. Alan Campbell, RNZAF NZ391857 – Front Gunner. Sgt. Gordon Edwin Caitcheon, RNZAF NZ404016 – Rear Gunner. The Wellington was shot down by AA fire near the target area, crashing at Fischbek, 18 miles South East of Stade. None of the crew survived. They were buried initially in a collective grave at Stade but later reinterred at Becklingen. F/S Sydney Bernard Thomas Davis, RAFVR 1165309 – Pilot. Killed age 20 on the 29th of August 1942. Son of Bert and Alice Davis, of Stroud, Gloucestershire, England; Husband of Edna May Davis, of Lightpill, Gloucestershire. Buried Adegem Canadian War Cemetery, Belgium.. Grave location – XII. E. 11. Ten aircraft were detailed to attack the above target. Bomb load of 4000lb. And 1000lb. 500lb. And incendiaries were dropped in the target area. Large fires were seen, A.A. fire was heavy but inaccurate, there were large concentrations of searchlights, enemy aircraft were very accurate. Wellington BJ.837, captained by Sgt. Hockaday reported that the whole town was ablaze and fires were observed 70 miles from the target. Four bomber and one presumed to be fighter were seen falling in flames. The nacelle tanks were pulled in the Amiens region, approximately 60 miles from the coast. Aircraft landed at Tangmere owing to shortage of petrol. On landing one tyre was discovered to be burst. Wellington X.3936 captained by P/O Trott, was attacked by ME.110 fire was returned and the rear gunner, Sgt. Hamerton, reported that the enemy aircraft was hit, no further fire was exchanged. the weather was excellent being clear moonlight over the target, navigation was very good by D/R and T/R. Wellington BJ.673 captained by Sgt. Davis and Wellington X.3389 captained by Sgt. Perks failed to return. Sgt. Sydney Bernard Thomas Davis, RAFVR 1165309 – Pilot. Sgt. Horace David Baittle, RCAF R.79439 – Observer. Sgt. Daniel Archibald McKay, RCAF R.73282 – Wireless Operator. Sgt. Charles Arthur Vickers, RCAF 1115126 – Front Gunner. Sgt. Lawrence Donald Hiltz, RCAF R.88319 – Rear Gunner. Wellington Mk.III BJ.673 was brought down at about 23:15hrs, 10 miles West of St Niklaas (13miles South West of Antwerp), Belgium. There were no survivors. The time and position of the crash, proximity from base and known strategies of enemy night-fighters in this area, indicates a strong possibility that the aircraft was shot down while en route to the target. The bodies were first buried in the Moerbeke Cemetery but were later reinterred in the Canadian War Cemetery, Adegem. Sgt. Harold Clyde Dawson, RCAF 178318 – Rear Gunner. Killed age 21 on the 26th of July 1943. Buried Scottow Cemetery, Norfolk, England.. Grave location – Grave 300. Sgt. Michael Henry Charles Ashdown, RAFVR 1320551 – Pilot. Sgt. Ronald Kenneth Harold, RAFVR 1335706 – Navigator. Sgt. Ronald Walter Threadgold, RAFVR 1457394 – Air Bomber. Sgt. Ernest Claude Denyer, RAFVR 1262911 – Wireless Operator. Sgt. Ronald Broadley, RAFVR 937347 – Flight Engineer. Sgt. Archie Cleveland, RCAF R.167518 – Mid Upper Gunner. Sgt. Harold Clyde Dawson, RCAF R.178318 – Rear Gunner. Stirling Mk.III EE892 AA-F came down in the sea off Southwold, Suffolk, while returning to base. Eyewitness reports indicated that the Stirlng was on fire before it struck the water. All on board perished. Four bodies were picked up by the Aldeburgh lifeboat crew. 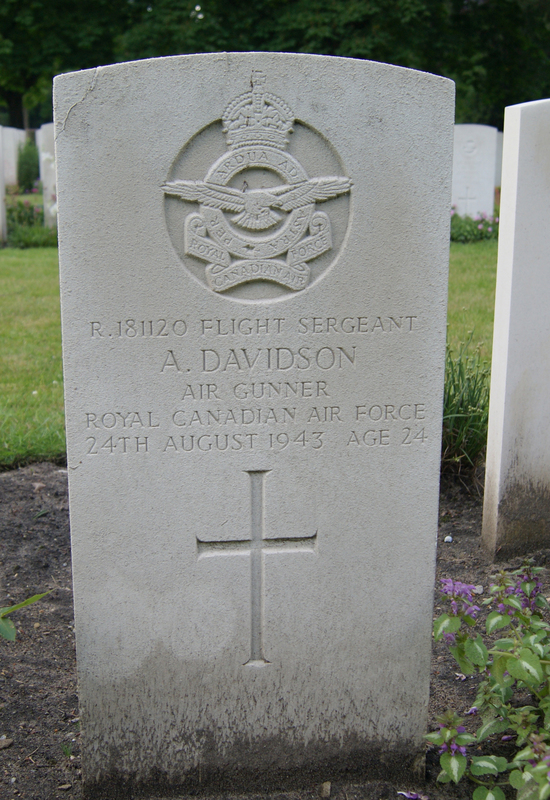 Sgt Dawson RCAF is buried in Scottow Cemetery; the others were taken back to their home-towns. Sgt’s Harrold, Threadgold and Cleveland are commemorated on the Runnymede Memorial. Sgt. Maurice Ronald Day, RAFVR 1375181 – Rear Gunner. Son of Charles William and Edith Day, of Potters Bar. Buried Paddington (Mill Hill) Cemetery, Hendon, Middlesex, England. *Nine Wellington aircraft from this Unit were detailed to carry out these attacks. One of these aircraft, X9981 captained by S/Ldr Chamberlain, failed to return to base. Wellington Ic X9975, captained by P/O Fisher returned to base owing to over heating of an engine. Direct hits were observed on the docks at Ostend and large fires were started which were visible for 90 miles. Incendiary bombs were dropped on a large factory and fires left burning. Other machines were dropping loads within 50 mile radius. A.A. fire was nil at primary, but there was a heavy flak after dropping bombs on Ostend. Searchlights were active to the East and West of target area. Weather was good. Sgt. Richard Charlwood Barker, RAFVR 1006997 – Pilot. Sgt. Ivor John McLaughlan, RNZAF NZ404390 – 2nd Pilot. Sgt. Harold Dawson Grimes, RAAF AUS.404532 – Observer. Sgt. G.F. Cole, RAFVR 961126 – Wireless Operator. Sgt. David Levick Beney, RAFVR 960078 – Front Gunner. *Interestingly, the Squadron ORB makes no reference to the Barker crew’s participation in the Op. This is doubly confusing that firstly the aircraft crash landed at Stadishall after being attacked by an ME.109 night fighter. During this attack, Sgt McLaughlan was wounded and the Rear Gunner Sgt. Day was killed. Sgt. Michael Irvine Ryder Day, RAFVR 1891503 – Rear Gunner. Killed age 19 on the 19th of November 1943. Son of Herbert Alexander Day and Mary Ryder Day, of Horley, Surrey. Buried Chiervres Communal Cemetery, Belgium.. Grave location – Grave 21. Sixteen aircraft were detailed to attack the above target with bombs of 2,000lbs, 1,000 lbs and incendiaries of 30 lbs and 4lbs. One aircraft failed to return, but the remainder successfully dropped their bombs in the target area. Except for one vivid red flash seen through the clouds, little results were observed. Heavy and medium A.A. Fire co-operating with Searchlights was encountered, but caused negligible damage. Some enemy aircraft were seen and a few combats took place but no damage was sustained by our aircraft. The aircraft captained be F/S R.Hunt met a J.U.88 which attacked his aircraft, the fire was returned and strikes were seen on the enemy aircraft. Our aircraft was then attacked by a FW190, the first was returned but the enemy aircraft disappeared. The weather was poor, being ten-tenths cloud over the target, there was also a fog at base which necessitated the aircraft landing at BRADWELL BAY on return. Navigation was very good. The missing aircraft was captained by F/Sgt. N. PARKER. F/S Noel Norman Parker , RAAF AUS.413240 – Pilot. Sgt. Robert Griffiths, RAFVR 1457278 – Navigator. F/S Jack Edwin Hyde, RNZAF NZ416637 – Air Bomber. F/S William Robert Kell, RNZAF NZ411755 – Wireless Operator. Sgt. Stanley Watkins, RAFVR 544249 – Flight Engineer. Sgt. William Gilfillan, RAFVR 1569298 – Mid Upper Gunner. Stirling Mk.III LJ442 JN-F came under attack from a night-fighter (Lt Otto Fries, 5 /NJG1) a short time after take-off while en route to the target over the Belgian coast. After a series of attacks by the fighter causing considerable damage, fire broke out in LJ442’s starboard wing and a crash-landing attempt was made by the pilot at Horrues, North West of Soignies, Belgium. Only the Captain, Navigator and Air Bomber survived. Parker and Griffiths evaded capture but Hyde, who was seriously injured, was taken as P.o.W. The four who died were buried at Chievres, 10 miles from Horrues. 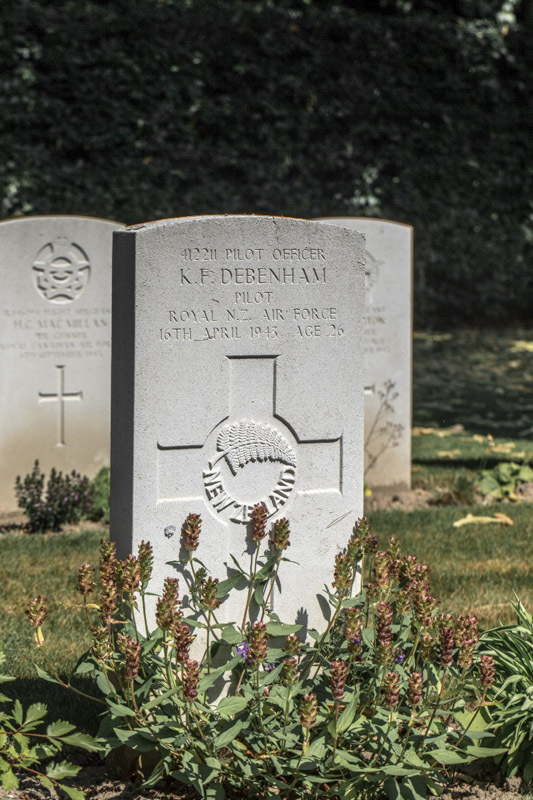 P/O Kevin Frederick Debenham, RNZAF NZ412211 – Pilot. Son of Frederick and Elizabeth Ellen Debenham, of Oxford, Canterbury, New Zealand. Grave location – 20. A. 10. P/O Francis Albert Gabrial Fernand Joseph De Labouchere-Sparling, RAF 41990 – 2nd Pilot. Killed age 20 on the 21st of May 1940. Son of Francis De Labouchere-Sparling and of Alice De Labouchere-Sparling (Nee Pollet). Buried Kain Communal Cemetery, Belgium.. Grave location – Grave 1. Eight aircraft detailed to carry out individual bombing attacks on above targets, six on target AACHEN and two on target DINANT. All aircraft carried 12 – 250lbs. G.P. fused N.D.T. bombs each. KCB.248 dropped 12 bombs on Marshalling yards and scored direct hits, and also KCB.249. KCB. 252 failed to locate target and returned to base with bomb load. KCB.253, KCB.256, KCB257 successfully attacked target, but unable to observe results due to intense searchlight activity. KCB.256 proceeded and attacked Power Station on S.E. of MAASTRICHT dropping three sticks of two bombs each. Two hits seen on railway siding beside station. KCB.267 attacked road and rail bridge at DINANT, all strikes very near. KCB.266 also on target failed to return. F/O John Noel Collins, RNZAF NZ2513 – Pilot. P/O Francis Albert Gabriel Joseph De Labouchere-Sparling, RAF 41990 – 2nd Pilot. Sgt. G. Thorpe, RAFVR 523426 – Navigator. AC John Stanley Brooks, RAFVR 622115 – Wireless Operator. P/O Leonard Phillip Redcliff Hockey, RAF 76011 – Rear Gunner . While attacking the road/rail bridge at Dinant from a height of approximately 3,000ft, Wellington Mk.1c R.3157 AA-H received a direct hit by an AA shell in the starboard engine. The aircraft crashed in flames near the township of Kain (Hainaut), 2-3 miles North North West of Tournai, Belgium. Both pilots were killed in the crash but the other crew-members baled out safely, thanks to courageous efforts by John Collins in controlling the burning aircraft long enough to enable them to escape at low level. They survived and were captured. This was 75 Squadron’s first operational loss of the war, and the death of F/O. Collins (one of the original members of the New Zealand Flight) was the RNZAF’s first fatal casualty of the war. Sgt. Harry Dennis, RAF 659116 – Air Bomber. Lost without trace age 31 on the 5th of February 1943. Son of Mr. and Mrs. R. H. Dennis, of Liverpool. Buried Runnymede Memorial, Surrey, England. Four aircraft were detailed to carry out the above operation with 1500 lb. mines. Three of the aircraft successfully planted their mines in the allotted area. All aircraft flew in cloud which was 10/10ths. from the English coast to the mining area. No A.A. fire, searchlights or enemy aircraft were seen. Navigation was very good. Stirling 1 BK617 captained by Sgt. R.E. Redding failed to return. This aircraft took off at 18.10 and at 19.43 a message was received that they had something to communicate to base, but this was never received. It was later reported that the aircraft was seen to crash in flames just off Cromer. Nothing further was heard of the crew, or the aircraft although a search was made by Air Sea Rescue. Sgt. Randolph Ernest Redding, RNZAF NZ414678 – Pilot. Sgt. Arthur James Douglas Barton, RNZAF NZ413700 – Navigator. Sgt. Harry Dennis, RAFVR 659116 – Air Bomber. Sgt. Cyril George Phillips, RAFVR 1201720 – Wireless Operator. Sgt. Robert Colin Legge, RCAF R.64510 – Flight Engineer. Sgt. Wesley William Wilson, RCAF R.113265 – Mid Upper Gunner. Sgt. Patrick Paul Deane Freeman, RNZAF NZ413305 – Rear Gunner. At 19.42hrs – 1hr 32mins after take-off – the crew of the third aircraft, Stirling Mk.I BK617 AA-D, despatched a signal to base indicating they had a further message to report, but none was received. It was later reported that the aircraft was seen to crash in flames just off Cromer, on the Norfolk Coast, on track for base. Nothing further was heard of the crew or the aircraft, although a thorough search was conducted by the Air Sea Rescue service. The circumstances seemed to indicate the likelihood of a catastrophic on-board fire resulting from a possible enemy air attack about 50miles from the SW end of the Frisian Islands, necessitating an emergency return to base. Killed age 34 on the 26th of July 1943. Son of Charles F. Denyer and Hannah Jane Denyer, of Staines. Buried Staines (London Road) Cemetery, Middlesex, England.. Grave location – Block E. Grave 9. 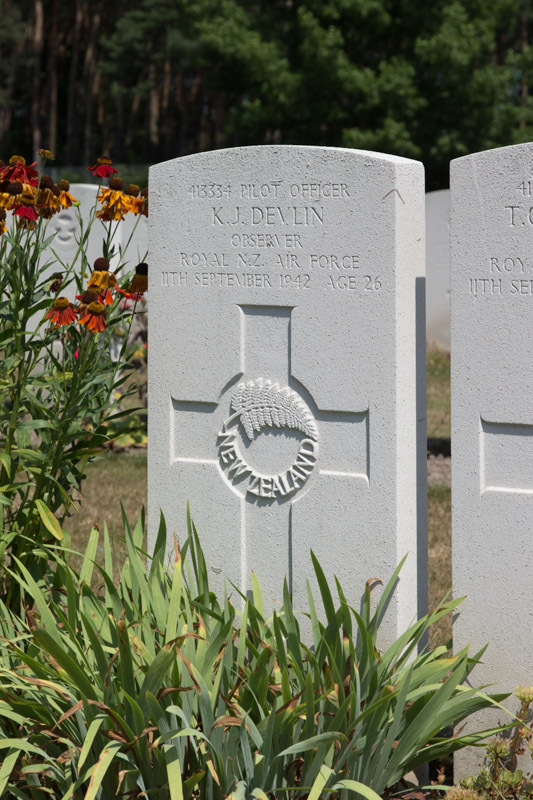 P/O Kevin John Devlin, RNZAF NZ413334 – Observer. Killed age 26 on the 11th of September 1942. Son of Joseph Calixtus Devlin and Dorothy May Devlin, of Wellington City, New Zealand. Grave location – Coll. grave 4. A. 20-21. Thirteen aircraft were detailed to attack the above target. Bomb load of 4,000 lb. and incendiaries were dropped in target area, Wellington X.3747 captained by Sgt. Rousseau and Wellington BJ.837 captained by P/O Jacobson were forced to return to base before reaching target area. owing to aircraft failures. Large fires were seen, a few dummy fires were also seen near target. Light and heavy A.A. fire was encountered, particularly in searchlight cones, which covered a large area. The weather was good, slight haze at target area. Navigation was by D.R. and T.R. Wellington BJ.828 captained by Sergt. Lees, Wellington BJ.968 captained by Sgt. Burrill and Wellington BJ.974 captained by Sergt. Metcalf, failed to return. Sgt. Thomas Otto Metcalfe, RNZAF NZ414386 – Pilot. Sgt. Desmond James Walshe, RNZAF NZ412912 – Wireless Operator. Sgt. Walter Foch Kelcher, RAFVR NZ411908 – Front Gunner. Sgt. Alexander John Locke, RAFVR 928209 – Rear Gunner. Wellington Mk.III BJ.974 was brought down by flak, crashing near Cologne, 20 miles South of the target Dusseldorf. There were no survivors. All five crew are buried at the Rheinberg War Cemetery. Sgt. Norman Hylton Dew, RAFVR 749538 – Rear Gunner. Killed age 29 on the 11th of June 1944. Son of Thomas and Annie Mabel Dew, of Thamesford, Ontario, Canada. Buried Tillieres-Sur-Avre Communal Cemetery, France..
Of the twenty four aircraft detailed to bomb Dreux, twenty two successfully attacked in good weather, the marshalling yards being visually identified until they were obscured by smoke. One aircraft had an inconclusive combat with a JU.88. The aircrafts captained by NZ422098 P/O. L. Bonisch and NZ422267 F/S. Donaghy, T. failed to return. F/S Thomas Rodgers Donaghy, RNZAF NZ422267 – Pilot. Sgt. Richard Parkin, RAFVR 1567334 – Navigator. Sgt. William Iorwerth Williams, RAFVR 1413546 – Air Bomber. Sgt. Harry Douglas Mitchell, RAFVR 1395992 – Wireless Operator . Sgt. Jack Vernon Lea, RAFVR 1472369 – Flight Engineer. Sgt. K.E. Jackson, RAFVR 1336192 – Mid Upper Gunner. Sgt Norman Hylton Dew, RAFVR 749538 – Rear Gunner. Lancaster Mk.I HK553 AA-S was attacked by a night-fighter to the west of the target and crashed near Tilliers- sur-Avre, where six of the crew were buried. Sgt Jackson, RAF, the Mid Upper Gunner, survived the crash and successfully evaded capture. Sgt. Harold Dewhurst, RAFVR 1094980 – Mid Upper Gunner. Killed age 23 on the 12th of May 1944. Son of Henry and Mary Ellen Dewhurst, of Little Hoole, Lancashire. Buried Aardenburg General Cemetery, Holland.. Grave location – Coll. grave 1-7. Twenty-four aircraft, representing the largest number of Lancaster aircraft so far detailed by this Squadron, were despatched to attack the marshalling yards at Louvain. Twenty-three aircraft successfully attacked in good weather. One aircraft (Captain NZ414591 A/F/L. S. Clark) claimed a JU 88 destroyed in combat over the North Sea. Another aircraft (Captain 151118 A/F/L. D. Warren) failed to return. F/L Derek Warren, RAFVR 151118 – Pilot. P/O Arnold Earle Irving, RCAF J.19819 – Navigator. P/O Donald Irwin Gage, RCAF R.166183/ J.19996 – Air Bomber. F/S David Clough, RAFVR 1193544 – Wireless Operator . Sgt. Francis Christopher Riley, RAFVR 1584169 – Flight Engineer. F/S Harold Max Hewett, RAAF AUS.419311 – Rear Gunner. ND919 exploded in flight and crashed at Castle Elderschans, about 1 mile West of Aardenburg, (Zeeland), Holland. The very brief circumstances suggest the fully armed aircraft probably came under attack by a night-fighter during the early stages of its outbound flight. There were no survivors. All seven crew were buried in Aardenburg General Cemetery. Sgt. Ronald Oswald Dibben, RAFVR 1252627 – Flight Engineer. Killed age 22 on the 28th of November 1942. Son of Bernard Oswald and Lydia Dibben, of Kingston-On-Thames. Buried Ham (St Andrew) Churchyard, Richmond, Surrey, England.. Grave location – Row 3. Grave 12. Crashed at 22:29 at Trinity Farm on Cambridge Road, near Oakington airfield. The aircraft stalled while trying to avoid a head on collision with another Stirling. The Rear Gunner, Sgt. Rogers, whilst surviving the crash, died two days later on the 30th of November. Sgt. Raymond Herbert John Broady, RNZAF NZ39691 – Pilot. Sgt. George Trueman Jobson, RAFVR 1287935 – Air Bomber. Sgt. Robert James Mcwilliam, RCAF 93977 – Wireless Operator. Sgt. Alexander Mcisaac, RNZAF NZ412891 – Mid Upper Gunner. Sgt. Charles Thomas Rogers, RAFVR 1170921 – Rear Gunner. Sgt. Vallance Albert Oliver Dimock, RNZAF NZ412317 – Rear Gunner. Killed age 22 on the 25th of October 1942. Son of Albert William and Rosy Dimock, of Wellington City New Zealand. Buried Valenciennes (St Roch) Communal Cemetery, France.. Grave location – Plot 4. Row A. Joint grave 16. Five aircraft were detailed to attack the above target. Bomb load of 1,000lb. 500lb. 250lb and incendiaries were dropped in the target area. Some slight A.A. fire was encountered, cloud stopped searchlight activity. No combats with enemy aircraft took place. 10/10ths cloud from the French Coast to the target made identification of the target difficult. Navigation was difficult owing to cloud preventing the use of Astro. Wellington Z1652 captained by Sergt. Hugill and Wellington BK725 captained by Sergt. McConnell failed to return. Sgt. James Allison McConnell, RNZAF NZ414646 – Pilot. Sgt. Selwyn Clarence Smith, RNZAF NZ41952 – Navigator. Sgt. Douglas Noel Tonkin , RNZAF NZ413285 – Wireless Operator . Sgt. Arthur Quinn , RNZAF 1095594 – Front Gunner . Sgt. Vallance Albert Oliver Dimock , RNZAF NZ412317 – Rear Gunner. Wellington Mk.III BK.725 was brought down by enemy action over France, crashing near Valencienns, 25 miles North East of Cambrai. All five crew were killed. They were buried at Valencienns. F/L Leonard Charles Dive-Robinson, RAFVR 143800 – Flight Engineer (Squadron Engineer Leader). Lost without trace age 23 on the 31st of July 1943. Grave location – Panel 119. F/L Laurence St.George Dobbin, RNZAF NZ401375 – Pilot. Killed age 29 on the 12th of August 1942. Son of George Hill Dobbin and Alice Dobbin, of Opunake, Taranaki, New Zealand; Husband of Marjorie Dobbin, of New Brighton, Canterbury, New Zealand. Buried Jonkerbos War Cemetery, Nijmegen, Holland. . Grave location – 24. F. 8. Nine aircraft were detailed to attack above target. Bomb load of 4000lb, 1000lb, 500lb and incendiaries were dropped in target area. A.A. fire was light, searchlights were scarce and ineffective. One fighter was seen by P/O Horne in Wellington B.J.765 as he was crossing the Dutch Coast homeward bound, no attack was made. The weather was moderate, being cloudy near target. Navigation was good by D.R. and T.R. Wellington BJ837 captain Sgt. Hockaday.N.J., five minutes from the English coast on way to target, fabric stripped off nose of aircraft to port and starboard, the Bomb load was jettisoned and the aircraft returned to base. Three aircraft failed to return, Wellington B.J.767 captained by F/O Dobbin, Wellington B.J.625, Sgt Barclay.T.S., captain, Wellington X.3646 captain Sgt Bradey.G.E. F/O Laurence St. George Dobbin, RNZAF NZ401375 – Pilot. Sgt. W.E. Braddock, RAFVR 1267404 – Observer. Sgt. James McQueen, RNZAF NZ404466 – Wireless Operator. Sgt. Jack Leslie Jury, RAFVR NZ411764 – Front Gunner. Sgt. A. Elson, RAFVR 751538 – Rear Gunner. BJ767 was brought down in the vicinity of Venlo (Limburg), Holland. It is not known how or why the aircraft came down, but the location of the occurrence almost certainly points to it being shot down by an enemy night-fighter while returning to base. Three of the crew survived the crash and were taken prisoners of war, indicating the captain, F/L Dobbin, had probably attempted a crash landing. Unfortunately he and Sgt Jury both failed to survive and were buried initially at Venlo. F/Sgt Peter Gerald Dobson MiD RNZAF NZ439022. Navigator. Killed age 28 on the 8th of September 1943. Died Wednesday 8th September 1943, age 28. Son of Henry Bruce Dobson and of Emily Daisy Houghton Dobson (Nee Cawte), of Blenheim, Marlborough, New Zealand. Buried Cambridge City Cemetery, England. Seventeen aircraft were detailed to attack the above targets. The carried their maximum bomb load in bombs of 1,000lb., and 500lb.. One aircraft crashed whilst taking off and two returned early. The remainder successfully dropped their bombs in the target area. Not many fires were seen but numerous huge explosions were observed. Some heavy and light predicted A.A.Fire and a few searchlights were encountered but caused no trouble. A few enemy aircraft were seen, but no combats took place. The weather was good and visibility was clear except for slight ground haze. Navigation was excellent. The aircraft that crashed during take-off was captained by F/O. I.R.MENZIES. Whilst taking off it swung off the runway and crashed into two houses on the far side adjoining the perimeter track. It caught fire almost simultaneously, and in the fire, various bombs exploded, causing the aircraft to be a total wreck. Three members of the crew, a W.A.A.F. Officer of R.A.F. Station MEPAL and an aircrew Sergeant, and 2 civilians were killed and other civilians were injured. The W.A.A.F. Officer and the aircrew sergeant lost their lives whilst trying to render assistance. Page 587, 1943. Form 540/ 541 AIR27/ 646 75(NZ) Squadron RAF, Mepal. National Archives. F/Sgt Dobson was killed by exploding bombs as he went to the assistance of the aircrew crew and the occupants of the houses. Killed age 33 on the 11th of June 1944. Son of Elizabeth Mary Donaghy; husband of Janet Brown Donaghy, of Wanganui, Wellington, New Zealand. F/O Michael McLoughlin Dowding, RAFVR 165070 – Navigator. Killed age 20 on the 27th of December 1944. Son of Harry Mcloughlin Dowding and Maud Christine Dowding, of Winchmore Hill, Middlesex. Grave location – 3. E. 21. As many crews as possible were required for an attack on Cologne. The target was cancelled and an attack on Rheydt was substituted. Inexperienced and special equipment leaders not being required the offer of 26 was reduced to 20. Aircraft took off carrying 1,000 ANM., 500 ANM., 500 M.C. and 250 G.P. Bombs. Visibility over the target was excellent and crews were able to identify the target, the flares being accurately placed. Clouds of smoke were seen to rise from the target. One aircraft AA”Q” captained by NZ421746 F/O H. Miles failed to return. This aircraft was seen to be hit by bombs and to spiral down. F/O Haddon Shaw Miles, RNZAF NZ421746 – Pilot. P/O Michael McLoughlin Dowding, RAFVR 165070 – Navigator. F/O Frederick John Gunn, RAFVR 1586226/ 163631 – Air Bomber. F/S Trevor Walter Coombridge, RNZAF NZ42653 – Wireless Operator . Sgt. George Frederick Haslam, RAFVR 2219498 – Flight Engineer. Sgt. Edward Left, RAFVR 1819854 – Mid Upper Gunner. Sgt. Denis Norman Mephan, RAFVR 1843114 – Rear Gunner. Lancaster Mk.I NN710 AA-Q was officially deemed to have crashed in the target area after being struck by a bomb, dropped from an aircraft above, when approaching the target. Only the air bomber, F/O Gunn, survived the crash but was captured as a prisoner of war. Other aircraft in the lower stream also were in the firing line from aircraft in the upper stream. HK576, F/O Pearson & crew, witnessed one such aircraft bombing from 23,000ft, that appeared to collide with a Lancaster flying alongside, which went down in a spin. It was later determined that NM710, F/O Miles and crew, was the aircraft going down out of control – possibly hit by falling bombs. Sgt. John Dowds, RAF 632780 – Mid Upper Gunner. Killed age 19 on the 26th of July 1940. Son of Mr. and Mrs. D. Dowds, of Musselburgh, Midlothian. Buried Amsterdam New Eastern Cemetery, Holland.. Grave location – Plot 69. Row A. Grave 23. 25/26 July 1940. Bombing Attacks on KASSEL, targets F.10, M.434. Of the nine Wellington aircraft taking part in the above operations from this Unit, one GB.661 (F/O Coleman) failed to return, and Squadron thus suffered its third loss since operations began. Early on the morning of 26th July, 1940, Wellington B.IC R3235 of 75 (New Zealand) Squadron, RAF, crashed into the Ijsselmeer, the inland sea near Amsterdam, 1km east of Uitdam. There were no survivors. The bodies of the airmen washed ashore, that of F/O Coleman on the 3rd of August, 1940. F/O John Wallace Downing, RAFVR 136351 – Navigator. Killed age 33 on the 23rd of May 1944. Son of Wallace Downing, and of Beatrice Downing, of Elmfield, Ryde, Isle of Wight; Husband of Esdale Downing. Journalist. 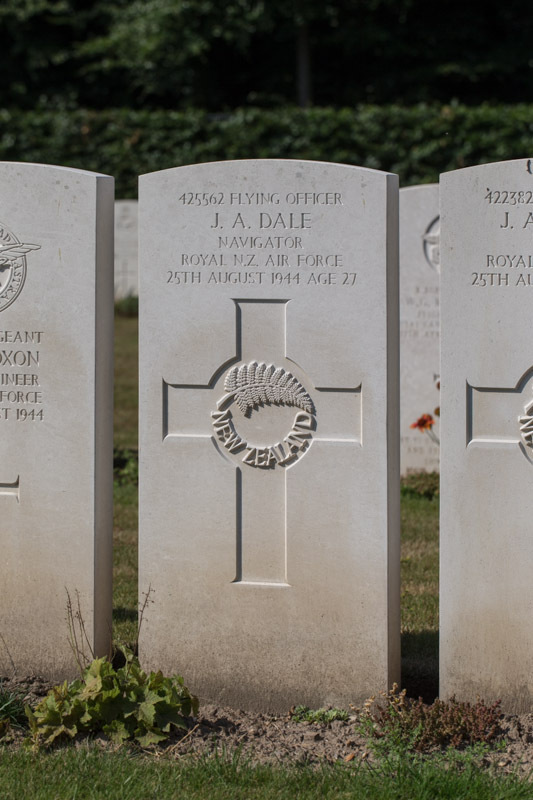 Buried Heverlee War Cemetery, Belgium..
P/O Edgar Lawrence Burke, RNZAF NZ417016 – Pilot. W/O Frank Albert Page, RAAF AUS.409481 – Air Bomber. F/S Alan Stevens Bromley, RAFVR 1247614 – Wireless Operator . F/S Walter Pickering, RAFVR 1434290 – Flight Engineer. Sgt. James Henry Cooper, RAFVR 1308375 – Mid Upper Gunner. Sgt. Donald Cameron Kitchener Grant, RAFVR 527237 – Rear Gunner. Lancaster Mk.I ME690 AA-Z was shot down by a night-fighter and crashed at Neerpelt (Limburg) 5miles from Lommel, Belgium, after breaking up in flight. There were no survivors. Their remains were reinterred in Heverlee War Cemetery, near Louvain. F/S Sydney Houston Dromgoole, RNZAF NZ402171 – Observer. Lost without trace age 28 on the 22nd of April 1942. Son of Victor Peter and Susan Sommerville Dromgoole, of Lyttleton, Canterbury, New Zealand. Grave location – Panel 117. Ten Well.III a\c were detailed attack the above targets. Bomb load of 4000lbs, 100lbs, 500lbs, 250lbs, 30lb and 4lb incendiaries was dropped in the target area but no results seen owing to cloud. There were only a few searchlights active and A.A. fire was slight. Well.III, X3487 captained by P/O Jarman was attacked by a JU.88 which attacked once and broke away to port. The results of this short attack were however serious the second pilot, P/O Nicol being mortally wounded, the rear gunner Sgt. Harris being killed and the Navigator Sgt. Taylor and W/Op. Sgt. Fernie were wounded. The bomb load was not dropped on the target but was dropped in the sea. The a/c was brought back to base and crash landed. Well.III, X3705, captained by F/S. McLachlan, was also attacked and the second pilot killed (P/O. Fountain) and Sgt. Tutty was wounded. F/Sgt. McLachlan managed to reach base and crash land. Wellington Mk.III X.3667 AA-J ? F/S Thomas Stanley Mahood, RNZAF NZ404916 – Pilot. Sgt. Cyril Charles Wrightson RNZAF NZ411998 2nd Pilot. F/S Sydney Houston Dromgoole, RNZAF NZ402172 – Observer. Sgt. Reginald Joseph Stephen Kelly, RNZAF NZ403580 – Wireless Operator. Sgt. Henry Thomas Owen McMahon, RNZAF NZ403019 – Front Gunner. Sgt. John Frederick McLinden, RAFVR 611555 – Rear Gunner. Wellington X3667 failed to return. Little is known of the circumstances leading to its disappearance, except that it was brought down in the sea near Le Havre. Only the body of the RAF rear gunner was later washed ashore, the remainder of the crew (all RNZAF) being lost without trace. W/O Keat Dudding, RNZAF NZ415522 – Wireless Operator. Killed age 25 on the 25th of July 1944. Son of Charles Henry and Zoe Fanny Dudding, of Whangarei, Auckland, New Zealand. Buried Cronenbourg French National (Mixed) Cemetery, Strasbourg, France.. Grave location – L. 9. Coll. grave 5-11. Twenty one aircraft took off as detailed to attack Stuttgart. Eighteen aircraft bombed the target with the aid of markers, but the raid appeared to be scattered. One aircraft returned early with engine trouble. Intense A.A. fire was encountered over the target, and fighters were fairly active, two aircraft having combats. Two aircraft failed to return, these were captained by NZ415216 P/O. J. McRae & NZ428800 P/O. K. Whitehouse. P/O Keith Owen Whitehouse, RNZAF NZ428899 – Pilot. F/S Jack Thomas Miliner, RAAF AUS.426367 – Navigator. F/S Ray Steele Horsford, RAFVR 1387835 – Air Bomber. W/O Keat Dudding, RNZAF NZ415522 – Wireless Operator . Sgt. Bernard Leighton, RAFVR 2209941 – Flight Engineer. Sgt. Robert Charles Baker, RAFVR 1624103 – Mid Upper Gunner. F/S George Alfred Badge Taverner, RAAF AUS.429835 – Rear Gunner. Lancaster Mk.I HK568 AA-K was brought down at 02.10hrs by an enemy fighter near the French/German border, on the northern outskirts of Strasbourg. All crew members were killed. They are buried in a collective grave in the French National Cemetery, at Chronenbourg. Sgt. John Lawrence Duke, RAFVR 2210530 – Flight Engineer. Died of injuries age 19 on the 28th of February 1945. Son of John Horace and Gladys Duke, of Stockport. Buried Stockport Crematorium, Cheshire, England. Grave location – Panel 3. Eighteen aircraft attacked Dortmund as detailed. Cloud was ten tenths over the target with tops 5-6,000 ft. No results were seen but bombing is thought to be concentrated. NZ428168 F/O N.H. Thorpe crashed in this country after passing over base in formation. Four members of the crew were killed. F/O Noel Humphrey Thorpe, RNZAF NZ428168 – Pilot. Sgt. George William Mcmanus, RAFVR 1806217 – Navigator. F/S Joseph McKenzie Alfred, RAFVR 1810280 – Air Bomber. F/S Allen Francis, RNZAF NZ427272 – Wireless Operator. F/S Frederick Henry Saffill, RAFVR 1882066 – Mid Upper Gunner. Sgt. H. Hark, RAFVR – Rear Gunner. ME450 arrived over base in formation then broke off with the intention of landing. It appeared that a loss of power then occurred in both starboard engines, with smoke coming from the starboard outer. The aircraft lost height in a gentle right turn and crashed NW of the airfield near the village of Chatteris, Cambridgeshire, at 16.10hrs. Four of the crew died in the crash, including the pilot, navigator, air bomber and M/U gunner. The wireless operator (F/S Francis), flight engineer, (Sgt Duke), and the rear gunner, (Sgt Hark), escaped injured. But Sgt Duke died from his injuries two days later. Sgt. 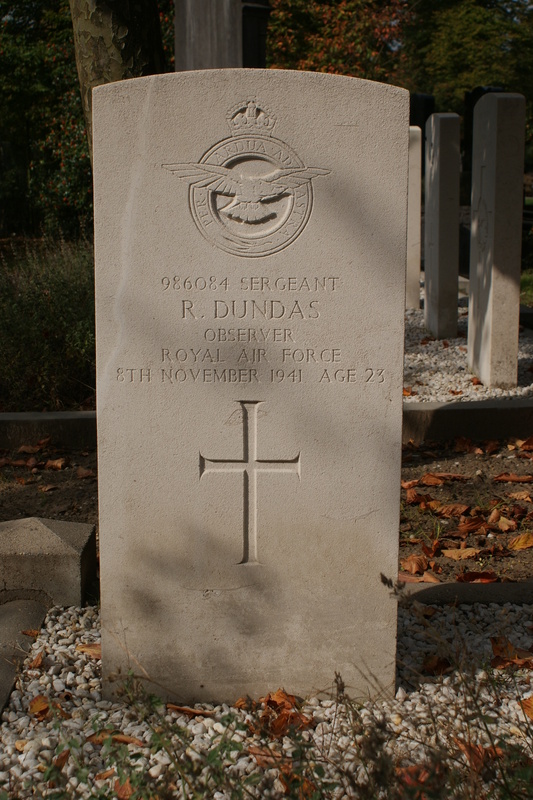 Richard Dundas, RAFVR 986084 – Observer. Killed age 23 on the 8th of November 1941. Son of Robert Elder Dundas and Edith Dundas, of Edinburgh. Buried Doetinchem (Loolaan) General Cemetery, Holland. Grave location – Row 1. Grave 8. Eleven Wellington Ic aircraft were detailed to carry out the above attacks from this Unit. Three aircraft, X.9628, captained by Sgt. Smith, X.9977, captained by Sgt. Nunn, and Z.8942 captained by Sgt. Wilson failed to return to base. Many large fires were started with resultant explosions and bursts were observed across a built up area. A railway junction south of target was also successfully attacked. Much heavy and light flak was experienced and heavy concentrations of searchlights were active in target area. Several enemy aircraft were seen at target but no attacks were made. Weather was moderately clear to target but haze 5/10ths to 9/10ths over target area. Navigation was very good. Sgt. Geoffrey Sidney Nunn, RAFVR 1252728 – Pilot. Sgt. Thomas Young Wyllie, RNZAF NZ40401 – 2nd Pilot. Sgt. Thomas Edison Elliott, RCAF R.52050 – Wireless Operator. Sgt. Alfred Hubert Harrison, RNZAF NZ403000 – Front Gunner. Sgt. William Massey, RAFVR 1365268 – Rear Gunner. The aircraft was shot down at 21:36hrs by a night fighter (Lt Werner Rowlin, III./NJG1), crashing to the ground at Ijzevoorde (Gelderland), east of Doetinchen, Holland. All crew members were killed and later buried at the Loolaan General Cemetery. P/O Allan Roy Frank Dunkerley, RAAF AUS.423083 – Air Bomber. Lost without trace age 33 on the 21st of November 1944. Son of Frank and Elizabeth Adelaide Dunkerley, of Drummoyne, New South Wales, Australia; husband of Myra Dunkerley, of Haberfield, New South Wales. Grave location – Panel 258. Three aircraft took off to lay mines in the Oslo Fjord. Two aircraft planted their mines in good visibility and without opposition. One aircraft captained by NZ417082 A/F/L L. Martyn, failed to return. F/L Leslie Arthur Martyn, RNZAF NZ417082 – Pilot. F/O Thomas Issac Elliot, RNZAF NZ421364 – Navigator. F/O Allan Roy Frank Dunkerley, RAAF AUS.423083 – Air Bomber. F/S John Calverley Crabtree, RAFVR 1492180 – Wireless Operator . Sgt. Charles Ronald Starkey, RAFVR 1863956 – Flight Engineer. Sgt. George Lindsay, RAFVR 1624589 – Mid Upper Gunner. P/O Andrew Roy Wright, RCAF J.88789 – Rear Gunner. Lancaster Mk.I NN745 AA-A was lost without trace. All seven crew are commemorated on the Runnymeade Memorial. Sgt. Derek Frederick Dunlop, RAFVR 1005738 – Wireless Operator. Lost without trace age 29 on the 12th of September 1941. Son of Thomas and Alexina Dunlop; Husband of Isabella G. Dunlop, of Glasgow. Grave location – Panel 42. Twelve Wellington aircraft were detailed to carry out the above attacks. One of these aircraft, R1038 captained by Sgt Roe, failed to return to base. Four aircraft failed to locate the targets, but the remainder all dropped bombs and fires were started. A.A. fire was intense and working in co-operation with searchlights which were working in cones. The weather was clear over the target. Sgt. Keith Vernon Dudley Roe, RAFVR 1250397 – Pilot. Sgt. Kenneth Aubyn Tomlinson, RAFVR 1108182 – 2nd Pilot. Sgt. Maurice Wyndam Stuart McVety, RAFVR 1252094 – Observer. Sgt. Norman Tweedie, RAAF AUS.402474 – Front Gunner. Sgt. Talfryn Barton Hopkins, RCAF R.64714 – Rear Gunner. Wellington 1C R1038 AA-H and crew was lost without trace. Sgt. Leslie Joseph Dunn, RAFVR 1001633 – Front Gunner. Lost without trace age 19 on the 12th of March 1942. Son of Elizabeth Dunn and Stepson of George Buglass, of Heaton, Newcastle-On-Tyne. Grave location – Panel 82. Eight Wellington aircraft carried out an attack against the above target, one aircraft, captained by Sgt Bell did not carry out an attack. Three aircraft captained by S/L Kitchin, F/O Sandys and Sgt Parnham failed to return to base. Bomb load consisted of 1,000 lbs, 500 lbs and 250 lbs was dropped in the target area, bomb bursts being observed. There was heavy and light predicted flak and large cones of searchlights in the target area and one twin engined enemy aircraft made one unsuccessful attack on Wellington III X3586 captained by S/L Newton. Weather was clear over the target with 5/10 cloud over North Sea. Navigation was by D.R. and TR1335. F/O John Frederick Kelly Sandys, RCAF J.4814 – Pilot. Sgt. Roy Desmond Joffre Woodcock, RNZAF NZ404985 – 2nd Pilot. P/O John Earle, RNZAF NZ401756 – Observer. Sgt. Henry John Price, RNZAF NZ404095 – Wireless Operator. Sgt. Leslie Joseph Dunn, British Army 1001633 – Front Gunner. F/L Thomas James Desmond Baber, RNZAF NZ39857 – Rear Gunner. There are no details regarding the fate of X.3585 and her crew, all being lost without trace. Lost without trace age 23 on the 21st of July 1944. Son of Lawrence and Hilda Dunn, of Golborne, Lancashire. Buried Runnymede Memorial, Surrey, England..
Sgt. Sydney Allan Dyer, RNZAF NZ40101 – Wireless Operator. Lost without trace age 19 on the 16th of July 1941. Son of Sydney Samuel Dyer and May Elizabeth Dyer, of Portobello, Otago, New Zealand. Grave location – Panel 63. Nine Wellington aircraft were detailed to carry out individual bombing attacks against the above targets. One of these aircraft, R.3171 captained by SGT. Fotheringham, failed to return to base. Another, W.5663, captianed P/O Rees, (RJT.533) was attacked by unidentified enemy fighter over the target. The aircraft was badly damages and the 2nd Pilot Sgt. Joyce was killed. SGT. Conibear, the front gunner, was seriously injured and died in hospital; and SGT. Gwyn-Williams was injured (Rear gunner). The aircraft returned to basewhere a landing was made. P/O Rees was awarded the D.F.C. ; and the wireless operator, SGT. Lewis, was awarded the D.F.M. RJT.147 bombed marshalling yard south of aiming point. RJT.319 Observed bomb bursts in target area. RJT.385 Attacked target area and saw bomb bursts. RJT.533 bombed target area, but thin cloud prevented accurate pin-point. RJT.570 reports big fire started by bombs on target area. RJT.683 located target, but it was not clearly pinpointed. A fix was obtained from Rhine and autobahn. Bombs dropped in salvo on large fire within radius of 3 miles of target. Sgt. Robert Ewen Ernest Fotheringham, RNZAF NZ391833 – Pilot. Sgt. Eric Vincent Keiran Higgins, RAAF AUS.400277 – 2nd Pilot. Sgt. Joseph Harold Campbell Roberts, RCAF R.54910 – Observer. Sgt. Phillip Edgar Hare, RNZAF NZ401227 – Front Gunner. Sgt. Douglas Malcolm MacKinnon, RNZAF NZ40923 – Rear Gunner. Sgt Fotheringham’s crew failed tio return from the operation – the aircraft was officially recorded as lost without trace. The circumstances were unclear, as no evidence, signals or reports came to light. It seems certain, however, that R3171 came down off the Dutch coast, since two bodies were later washed ashore, one being identified as the captain.